10 Foot Graphic Package 1: This basic 10 foot pop up display packages features a wrap around header to compliment 3 large graphic images featuring images of your product or service. One of the front runners in the online retailers of trade show displays, and exhibits is ShopForExhibits.com, as they continue to expand what they make available to their nationwide clientele, through their display rentals program which was begun only two short years ago, and the new tension fabric products. By launching a new state of the art web site, ShopForExhibits hopes to keep pace with future growth challenges by supplying prospective customers with the knowledge and product information needed to build confidence in an expanding web retailing strategy. Many challenges lie ahead for retailers in this fast paced industry, which is often faced with reacting to a variety of business downturns, due to the uncertain business climate. 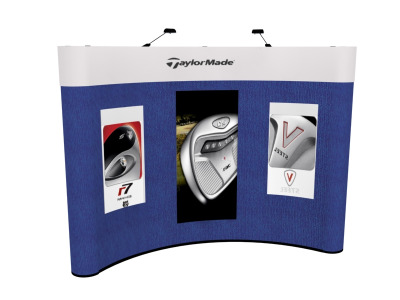 The majority of people in the trade show business will struggle in the coming months to successfully market new products such as custom modular hybrid displays, but because of their years of experience in the trade show industry, coupled with their competitive web site skills, SFE appears to have what it takes to come out ahead.